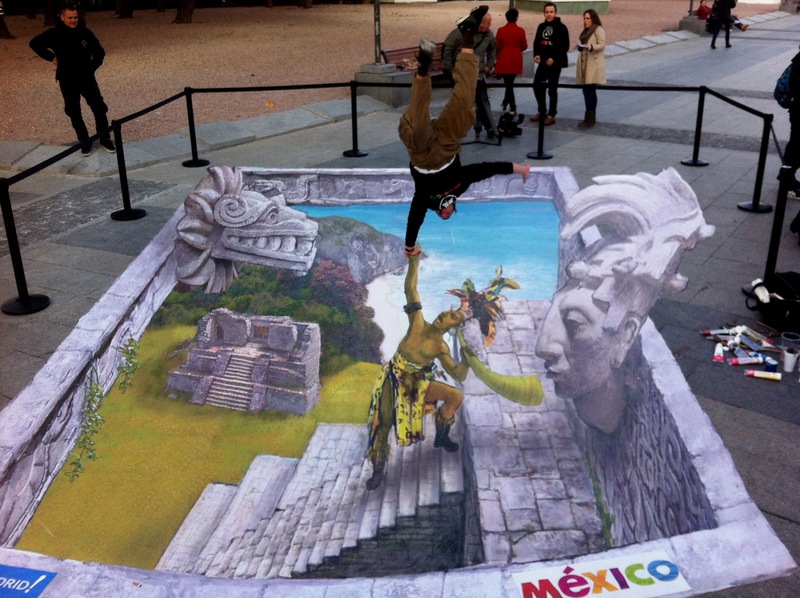 Because 2D is not enough, 3D street art jump ahead to find you and level up your artistic skills. 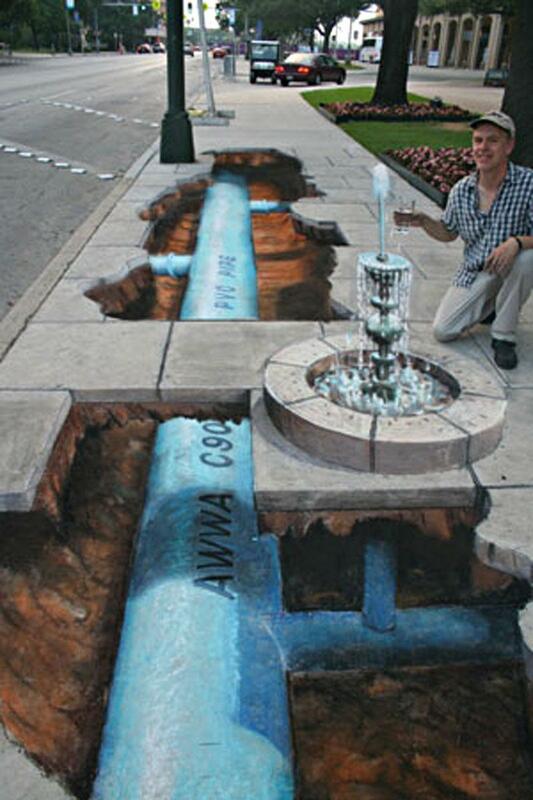 Everything is about perspective with this 3D street art, you should see how this painting changes if you just turn a little bit. The beauty of this is the how your mind could be tricked by a twist in your reference points. 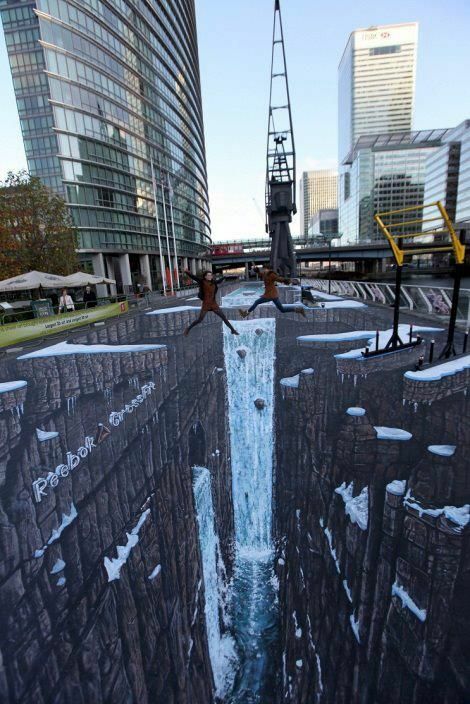 Take a look and discover that you could be climbing or jumping from the largest waterfall ever with this surreal street art. We hope this unique art paintings collection works as inspiration for your work or a starting hobby. 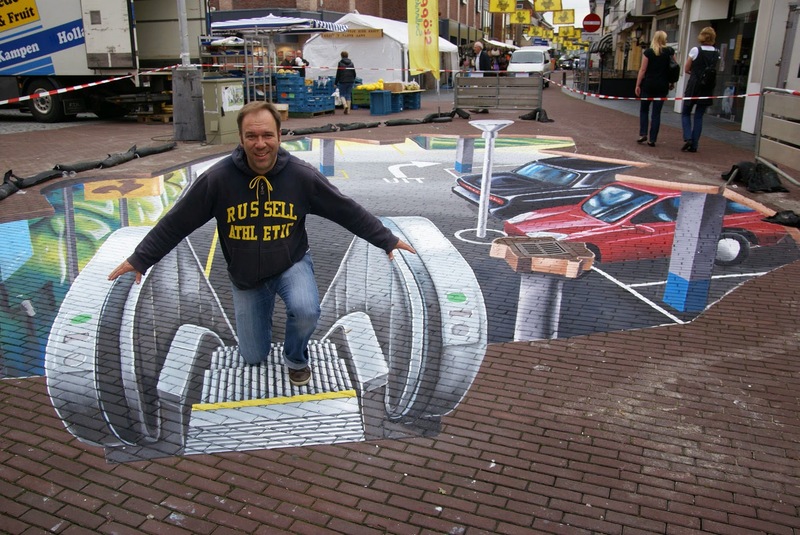 We know for sure you are going to love all the cool effects these artists share with us. 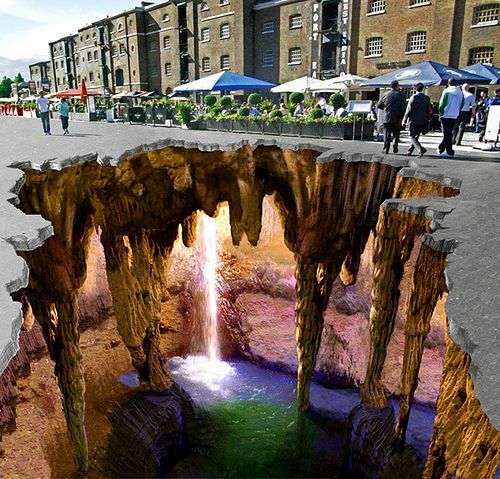 You don’t want to fell down in this cave. A great waterfall illusion for the stranger to this kind of art, but once you get into this, there’s no way to stop your imagination flows. The safest river in the world! Even if it has a crocodile on it! 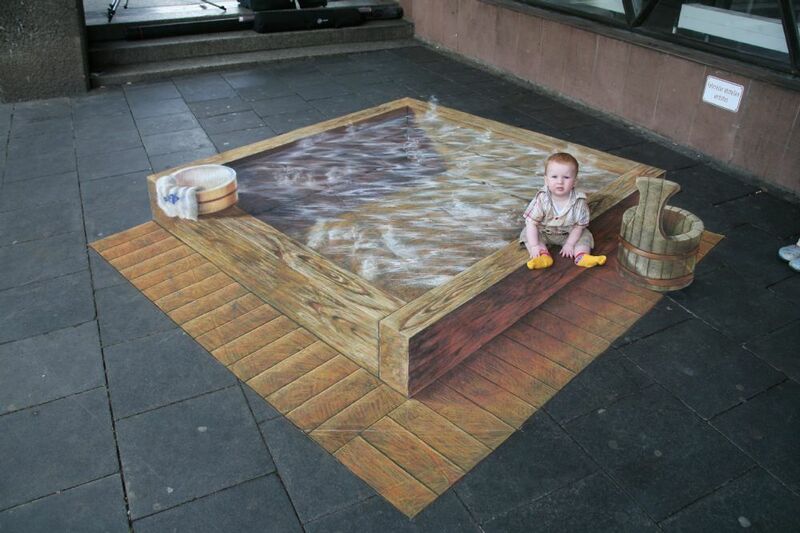 A great visual effect for this street art, and believe it or not even the floater is part of the painting. Try to stay calm while passing this tightrope, be aware of the stronger wind on the crag. Give it a try with a friend but first sign out the contract exonerating responsibility. We know what you are thinking! Jaws! An amazing piece of work for a shark coming out from the ground. 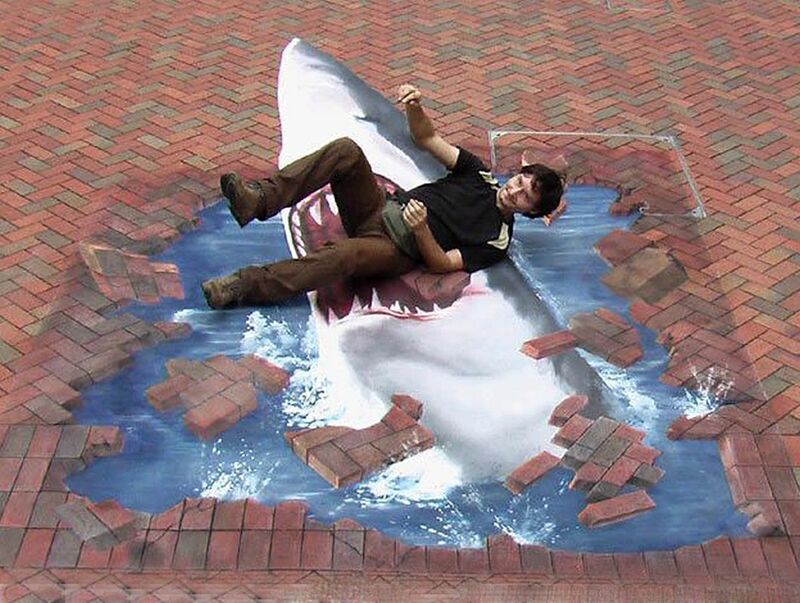 Even the bricks seem to be in the air while the shark is trying to kill you. This is one of my favorites, I mean look at it! All the place look burnt down and there’s no place to walk safely. This one could give you one of the most amazing painters pics for your Instagram. Be Careful! and walk slowly while passing this ladder. But look at the crag! A bad step could mean falling like in the Journey to the Center or Earth movie! Sometimes I had tried to give that mime effect when they look like coming up or coming down from escalators, and never worked right. But this one sure will give that effect. A little bit creepy for my taste but still and amazing work. The girl looks trap in this movie world represented by the film tape and the tickets window. At first look, I actually thought that the guy was in the pool, sorry, my bad. 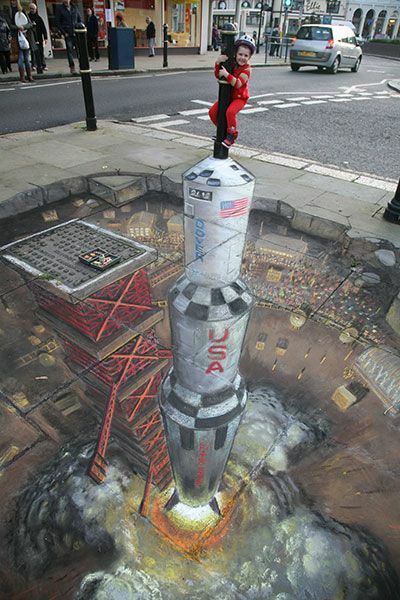 But this tell you how cool is this street art! Be careful of the little pets inside the water. Time to get a bath, my little friend. Just take your towel and let the relaxing times begin… Maybe the water is a little too hot for you but with time you will use to it. Great way advertise your local store. This river proof that creativity is all over the places, you just have to find the best ways put your ideas to work for you. One of the saddest yet true arts you will find. The stress is one of the most concerns topics nowadays, it could kill you if is not detected on time. 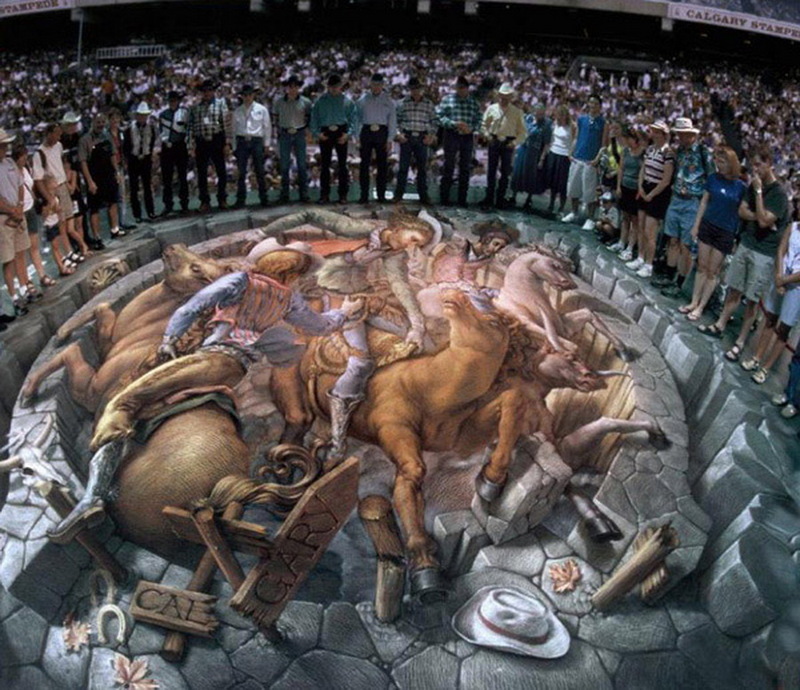 Take a break and just enjoy the art. Thinking about saving? while this is a perfect way to remind your new year purposes. No one of these three little pigs went to market, everyone stayed at home. Great shape and great art! Grab the hand of the Maya emperor and get back in time to find this amazing culture customs and traditions. 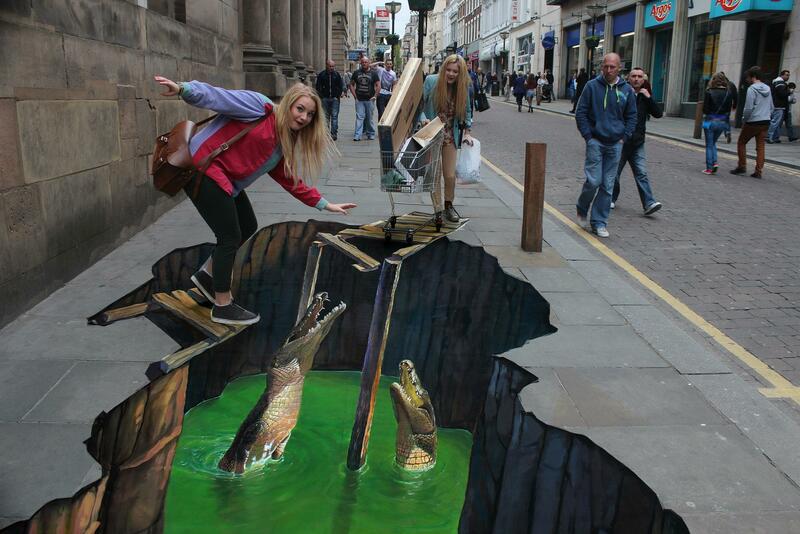 I think we found the pattern of this street art and is that people love to be threatened by crocodiles! This time you and a friend could be the food these fellas are waiting for. You may think, is this giant is just relaxing or did he fell and hurt? either way, this street art is perfect for a family picture, Just don’t mess out with this giant, please. 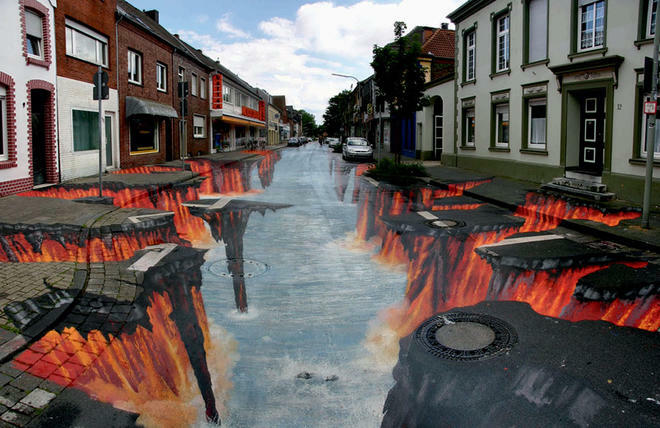 Oh man, I love this kind of street art. 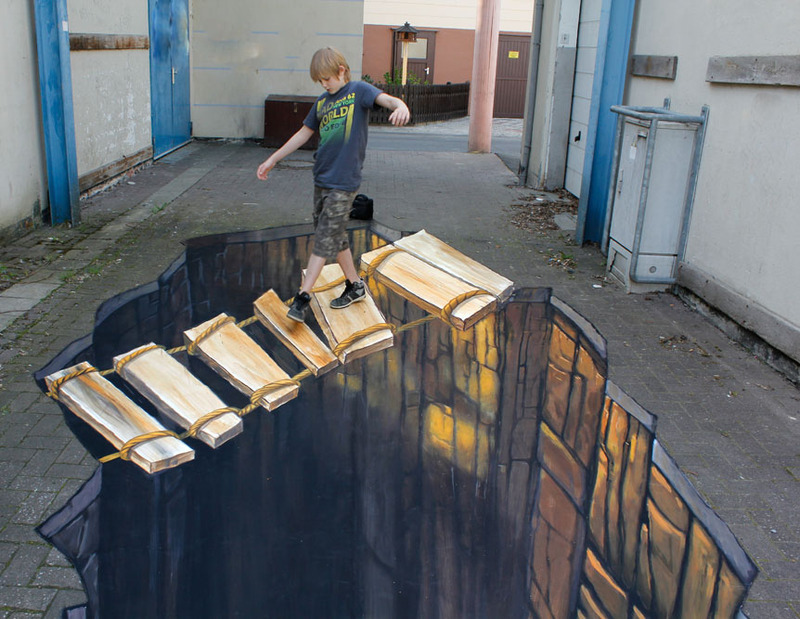 The illusion of being at the edge and almost falling is amazing! Even the traffic jam y the people waiting to cross the street is well taking care of. 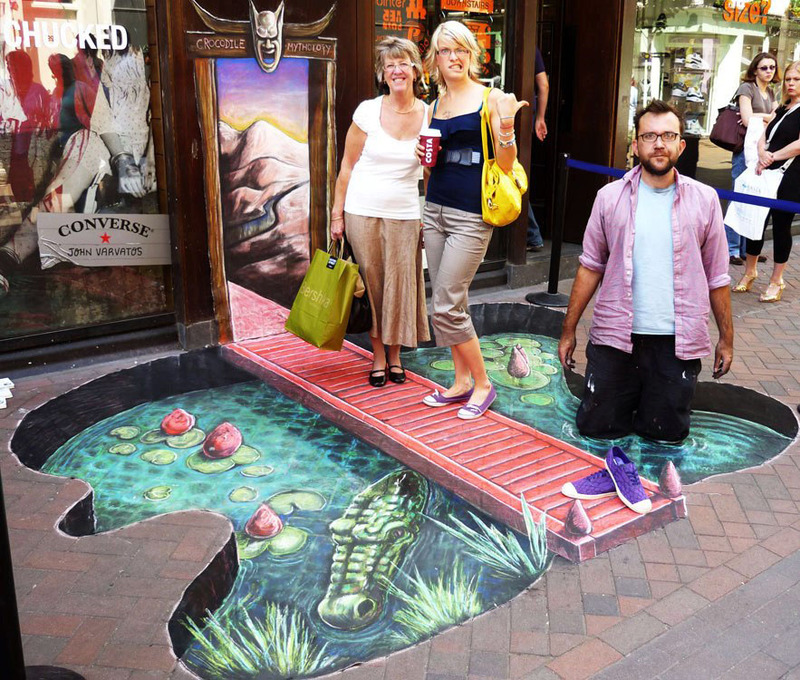 As you can see street art could be used for advertising, but that doesn’t take off the fun from the painting work. Have a great time with your friends taking pictures trying to pass this crag. Great way to slow down the traffic. Also, a great way to get a profile picture for Facebook or Instagram. There’s a river down there so be careful! 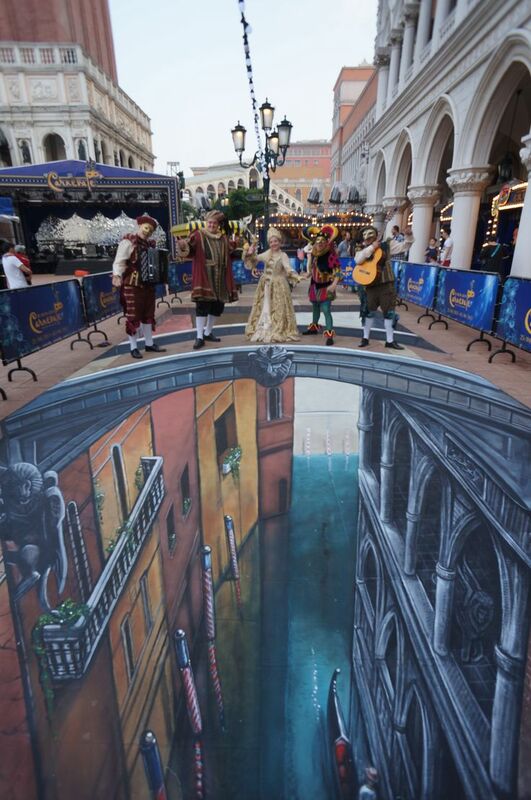 Did you ask for medieval street art? right here, sir! the costumes and the calm river make you feel like those romantic movies when the couple is just starting to falling in love. An epic battle is going on! and the horses make this an even battle. Be a witness of this encounter and choose a side… the best side to get the perfect picture! Hold on little buddy, the rocket is about to departure. Are you agree with me by saying this is the top cherry for a street art collection? spread the word and make your own street art. Also, a picture like this will work as a cool background. Well, your dog may be disappointed when he finds out this is not and endless fountain to play with his other dog friends. But still, a great picture could be taking next to it. Where in the heck are we going to plug in this electric cord?